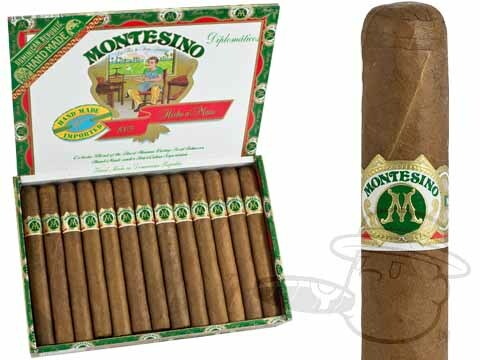 Produced at Tabacalera A. Fuente, Montesino cigars are a touch mellower than the regular Fuente line, and they come at a great price. Handmade with Connecticut shade wrappers, Nicaraguan binders and Dominican long-filler leaves, these mellow-to-medium-bodied cigars present clean taste and a spot-on burn on each carefully crafted stick. Excellent cigar with consistent quality and reasonable price. The cigar is the perfect size, is mild and smokes evenly. I have enjoyed then for ten years now. Montesino Diplomaticos Natural is rated 3.5 out of 5 based on 9 customer ratings.